Training times every Tuesday & Friday night at grounds at the Low Field, Basin View from 7.15pm. A game that was in the balance right to the final whistle where a draw was probably a fair reflection of a game played in a good competitive manner. Dynamos welcomed new debutant goalkeeper Aidan O'Sullivan formerly of Tralee Celtic and Connor O'Brien who transferred from St. Brendan's Park. Connor was to make an immediate impact early in the game winning the ball on the left wing getting past two defenders before finding Billy Stack 30 yards from goal centrally, Billy took control of the ball before unleashing a powerful effort that found the top left hand corner of the net despite the best efforts of Brian O'Reagan in the Fenit goal. Fenit who were a constant threat capitalised on a defensive mixup to score from 8 yards out giving O'Sullivan no chance in the Dynamos goal. A few minutes later Dynamos had strong appeals for offside that were waved away with Fenit taking the lead from their opportunity. Dynamos continued with the same starting 11 and were on the front foot straight away with Kevin Williams, Billy Stack & John Farragher driving the team on for midfield. Another moment of controversy when Dynamos through Thomas Burke played a high ball into the box and with O'Reagan rising highest in the square it looked like the contact if any made with him was from his own team mate and when the ball broke lose Damien Diggins scored from close range only for the referee to adjudicate that the keeper was fouled and restarted the game with a free kick. Dynamos made a number of subs at this stage with Tony Duggan replacing Thomas Burke, David O'Connor replacing Keevan McElligott, Aaron Dewey making a welcome comeback from a long term injury to replace Connor O'Brien who impressed on his debut. Adi Cenali replaced John Farragher and a few minutes after entering the field Adi broke through the defense and with the keeper advancing Adi got his shot off forcing an O'Reagan save with Adi Cenali reacting fastest to shoot to the net to give Dynamos a share of the spoils. Both sides created a number of half chances with neither side threatening either keeper and with the final whistle a draw will be deemed a fair result. Man of the match: David Rogers our young and very talented centre back who reads the game like a veteran. These sides met a couple of weeks ago and provided 10 goals it could easily have been the same scoreline today with both sides creating so many chances. Dingle have really strengthen their squad with additions Greg Horan, Darragh O'Brien, James Duggan and young James Hurley. Dynamos are delighted considering we were 3-1 down inside the last 10 minutes and 4 subs made Dylan Curtin, Tony Duggan, Junior Ankomah & Nathan Gleeson all 16 year old players who all contributed to a great point for Dynamos. To have this level of youth you have to have encouraging experience around them and we had that in abundance with great credit to our senior players for the environment they have created for our youngest to develop. Goal scorers Damien Diggins with 2 and Stefan Cvetkovic Cvele with our goals. DIGGINS WITH A DOUBLE ON HIS RETURN. Dynamos travelled to Gallurus today where we had all 4 seasons in the one day. Midway through the second half referee Ray Matthews took both teams off the pitch due to the severity of the hailstones over the space of a few minutes. Tralee Dynamos were delighted to welcome Damien Diggins back into the squad earlier in the week and it didn't take long for Damien to announce his return to the KDL Premier with a goal that gave Dynamos the lead with a strike from just inside the box beating keeper Barry Galvin. Dynamos were to concede some terrible goals the first went inside the post at the near post from a corner on the right side. Things got worse for Dynamos when playing out from the back and a misplaced pass from our defender and with our keeper out of position Sean O'Connor scored from 30 yards into a empty net. Dingle then breached a high line from Dynamos who had a weak call looking for offside where Sean O'Connor finished easily to the net despite the best efforts of the Dynamos keeper. Things looked to get worse when centre back Jonathan Burrows had to come off injured with 15 minutes to go to the break. Quality players recognise the danger signs and react and respond with Damien Diggins getting his second goal despite his back to goal he headed a Kevin Willams free kick goal wards and beyond Galvin in the goal to close the deficit to one goal. Diggins become the provider a few minutes later coming across the goal line showing great composure and timing with his cross to Thomas Burke who headed to the net from close range. The weather for the second half was glorious sunshine a big departure from some of the rain in the 1st half. Dynamos were putting together some better passing movements early in the second half without really troubling Dingle in the second half. Dingle got a corner on the left side of the pitch and there to head to the net was Rian O'Sullivan who scored from close range to give Dingle the lead. Dynamos got a corner of their own that Thomas Burke took with our flying Scotsman Alastair Harbison to powerfully head to the net to equalise at 4 a piece. Joe Sheehy got on a free kick from 40 yards out and his effort which was attempting to find a team mate seemed to get caught in the wind and our keeper who misjudged the flight of the ball landing into the net to give the hosts the lead. Next up was the hailstone shower with both teams leaving the pitch sheltering behind the sponsors advertising boarding for over 2 minutes. The break seemed to galvanise Dynamos and from here to the final whistle it was all Dynamos. 1st up Kevin Willams linked up with John Farragher from 25 yards out hitting a powerful strike just inside the post to equalise the game at 5 a piece. Kevin was to have two more strikes ending up either side of the post. Man of the Match: Damien Diggins, with 2 goals and an assist and his constant presence leading the line for Dynamos made him the standout performer on the day. Dynamos opened their FAI JUNIOR CUP with a win in Clare today. Przemek Skrzypczak with 2 goals, Billy Stack, John Farragher, Kevin Williams and Derek O Shea with a last minute penalty gave Dynamos their opening win of the season. Many thanks to our host Kildysart Celtic FC who had their facilities in top class condition for the contest. The hospitality provided to our team and supporters at Mitchels bar by our hosts was excellent. Man of the match: Billy Stack mobility in midfield was a personal credit to him. To cap of his performance with a 25 yard strike after great team build up play. In a very competitive game that had plenty of talking points along with 3 penalties a red card and a host of bookings. Unfortunately for Dynamos they were on the wrong end of the result for a second consecutive week despite contributing so much to the game. Dynamos would man up and accept both goals were of our own making with unforced errors leading to both penalties conceded. Tommy Feehan of Castleisland dispatched the first penalty passed new signing Patrick Fitzgibbons who did well on his debut unfortunately midway through the second half from an under hit back pass that gave the Castleisland striker a 1 on 1 on goal. Patrick was to take down the striker for a penalty and was red carded. Centre back Mark McDonnell went into goal and had no success with the 2nd penalty dispatched to the net by Tommy Feehan. Dynamos seemed to react better going down to 10 men lead by the returning legend Billy Stack who gave the team so many options with his mobility. Kevin Williams got a goal back for Dynamos from the spot after Stefan Cvetkovic was taken down in the box for a penalty. A couple of half chances were the best Dynamos could muster in the last couple of minutes that Stephen Bartlett comfortably saved in the Castleisland goal. Next week Dynamos take a break from the league with a trip to Clare for a meeting with Kildysart Celtic of Clare. Our premier season got under way in Celtic Park today and despite a very good performance we left empty handed as Danny Roche netted a double for Killarney Celtic on 61 and 90 minutes to overturn our 2-1 lead and give Celtic the win and 3 points on offer. Dynamos gave senior starting debuts to 6 players with Jonathan Burrows, Tony Duggan, Kevin Willams, Ivan Kolarevic & Przemek Skrzypczak from last season's side. Credit to the players for their performance and we are sure over the coming months as players get experience and understanding with each other that the Dynamos will have a part to play in all competitions. Senior debut to goalkeeper Jack Rogers who was to have a very impressive Premier debut. It would only be fair to mention Celtic keeper Robert Osborne who along with Jack both keepers 17/18 years of age gave performances that belied their age. 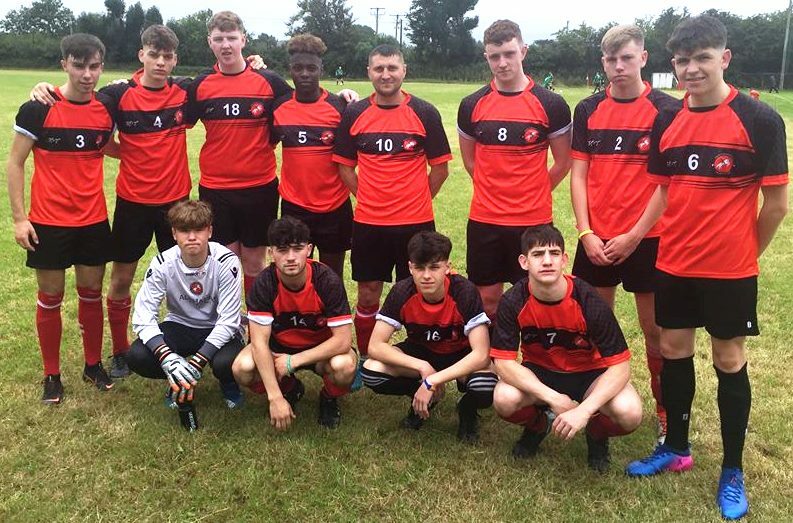 Dynamos gave Premier senior debuts for Thomas Burke, Lungelo Noel, Stefan Cvetković, Patrick Roche, Mark McDonnell, Dylan Curtin all contributed well to Dynamos. Dynamos opened the scoring on 16 minutes with another quality goal from Przemek Skrzypczak. The old adage is directly after the goal you are at your most vulnerable. Celtic attacked and were awarded a corner which was headed to the net by Pa McGrath at the near post. On 41 minutes we scored one of our best goals at Celtic Park with 5 man move started by goalkeeper Jack Raymond who in turn found Dylan Curtin who moved it up the line to Stefan Cvetković. Stefan found Kevin Williams who made one of his many explosive runs from midfield this time a diagonal run getting on the ball from Stefan getting past his man before sending a vicious cross that was met by Tony Duggan flying in from the left hand side to hit a thunderous shot to the net to give Dynamos a deserved 2-1 lead the kept to the half time break. The second half ebbed and flowed with both teams have periods of dominance and chances but both keepers were dominant with saves. Celtic got back into the game with a penalty on 61 that Danny Roche dispatched to the net with Jack going the wrong way. 2-2 with a half hour left and all to play for with the game right in the balance for Dynamos we had 4/5 counter attacked where Celtic's high line was breached only for a couple of offside calls that might have gone against us. Midfield was the key to both sides with an intriguing battle over the 90 minutes, Kevin Williams and Ivan Kolarevic for Dynamos and Gary Keane alongside Pa McGrath gave as good as they got in a classic midfield battle. Dynamos had another move with a ball in behind the Celtic defence with Przemek Skrzypczak getting himself past the central pairing of John McDonagh and Chris Brady getting into a 1 on 1 with Osborne in the Celtic goal. Przemek shot at goal was saved by Osborne only for the ball to rebound to Przemek who went over the keeper only to be denied by the crossbar. This was to be Dynamos last chance in the game and a couple of minutes later with Dynamos on the attack Celtic got possession moving swiftly up the pitch with a number of players involved Jack got the save the shot at full stretch only for the ball to fall into the path of Tralee man Danny Roche who rifled to the net to give Celtic the 3 points on show. Man of the match: Jack Rogers in the Dynamos goal for his overall performance making crucial saves at times. A special mention as well for Jack for his distribution. Squad: Jack Rogers , Dylan Curtin (Adi Cenali), Jonathan Burrows, Patrick Roche, Thomas Burke, Tony Duggan (David O'Connor), Kevin Williams, Ivan Kolarevic, Stefan Cvetković, Lungelo Noel (Mark McDonnell), Przemek Skrzypczak (Derek O'Shea), Michael Abidemi Lally, Philip Evans. Tralee Dynamos will play in the Kerry District League Premier A Division for the 2018/19 Season. Premier A: Tralee Dynamos, Tralee Celtic, Mitchels Avenue, Listowel Celtic, Killarney Celtic, Killarney Athletic, Fenit Samphires, Dingle Bay Rovers, Castleisland F.C.